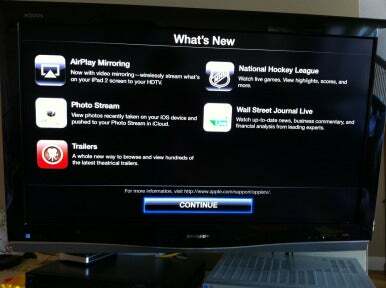 As part of its barrage of updates on Wednesday, Apple bumped the second-generation Apple TV’s software to version 4.4, bringing with it support for Photo Stream, AirPlay mirroring, NHL hockey, Wall Street Journal content, and more. Photo Stream, part of Wednesday’s introductions of iOS 5 and iCloud, lets you view photos on your Apple TV that you’ve added to your iCloud account. Also new is AirPlay Mirroring, which lets you wirelessly mirror the contents of your iPad 2 or iPhone 4S’s screen on your TV via the Apple TV. Apple has now added the National Hockey League to the growing roster of paid professional sports subscriptions you can access on the Apple TV. Apple added baseball and basketball streaming to the device in March. Another new offering is Wall Street Journal Live, which provides free up-to-date news, business commentary, and financial analysis video. A new Trailers area let you browse and watch hundreds of movie trailers. Finally, Apple added three new slideshow themes—Photo Wall, Flip-up, and Shifting Tiles—and added Netflix support for subtitles when available. The update also includes a variety of security fixes, addressing various vulnerabilities that could allow an attacker to steal your login credentials, cause crashes, or conduct other nefarious behaviors. Updated 4:33 p.m. ET with information on the security aspects of the update.